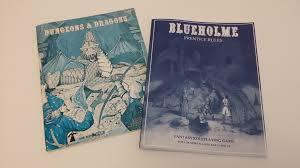 Posting a link to a good review of Michael Thomas's Blueholme Prentice Rules by Glenn Halstrom from Glenn's Youtube Channel, the Old Grognard. I am truly looking forward to owning and playing a copy of Blueholme Journeymanne Rules, Dreamscape's latest effort. Really cannot wait to see the treatment of the higher levels and to see the world of Blueholme, which the Prentice Rules didn't encompass. But the Prentice Rules have still gained a place on the map and rightfully so! The price is great, and the amount of love that went into the project is evident in the design. The simplicity of Holmes style dungeon and wilderness design and the light weight rules are one of Blueholmes' greatest strengths. I am a firm believer that rpg's should be simple when it comes to what we call "mechanics"--so many classic games that had beautiful atmosphere, world settings, artwork and design and amazing concepts are not being widely played today because they were cumbersome rules sets, while the simpler games of old continue to evolve in ever new forms. Glenn Halstrom gives a very good presentation of what is great about this game.